Romantic atmosphere: Ceiling star can make your car romantic and unique, comparable to the top luxury cars, but requires some practical ability. 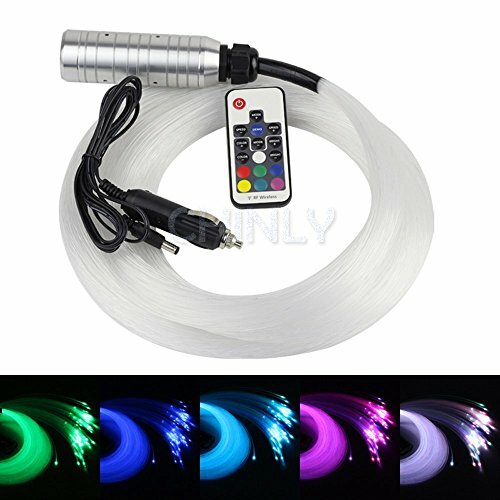 High Quality Material: It uses RGB lamp beads, have pure white, the most suitable for the stars. High brightness, energy saving, long service life. Specification: DC12V, suitable for car, 18key remote controller, easy to use. 100 strands * 0.03in * 6.5ft long fiber optic cable. Wide Application: Car use, Sitting room, Living room, Bedroom, Kitchen, Dining Room, Home, KTVs. Warranty: 2-year warranty, the seller bear the freight. If you are not completely satisfied with your purchase, just feel free to contact us. If you have any questions about this product by CHINLY, contact us by completing and submitting the form below. If you are looking for a specif part number, please include it with your message.